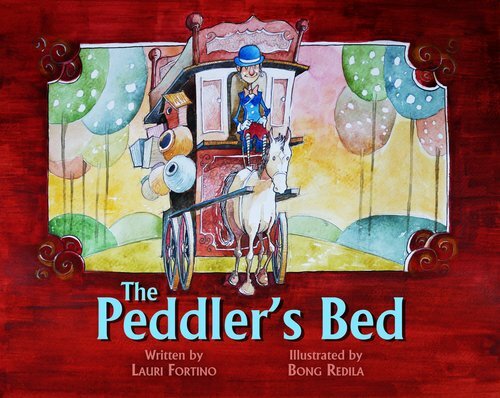 Lauri Fortino’s debut picture book, The Peddler’s Bed, is a feel good story that reads like a folktale, and simply begs to be shared with the entire family. 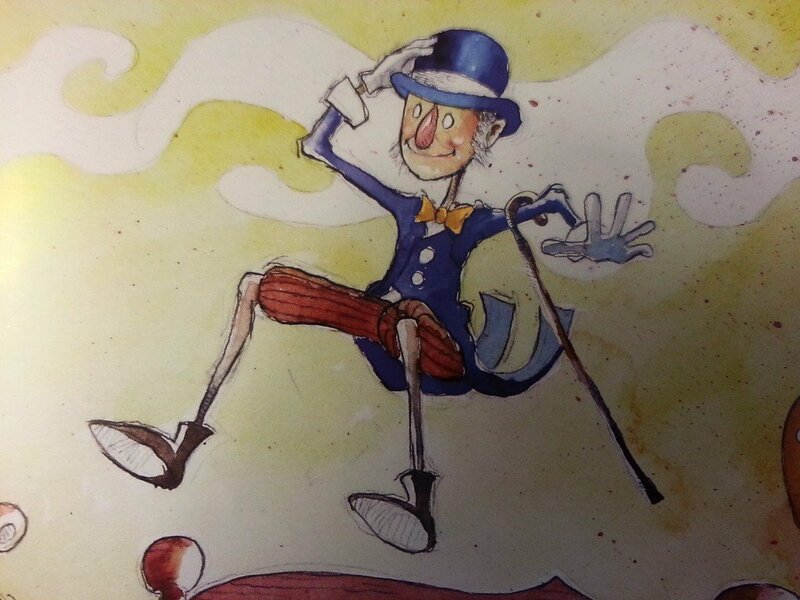 Illustrator Bong Redila’s artwork, mixing ink with watercolor, complements Fortino’s engaging text and brings a magical and colorful quality to the book as seen in the images included in this post. Interior artwork from The Peddler’s Bed written by Lauri Fortino with illustrations by Bong Redila, Ripple Grove Press ©2015. 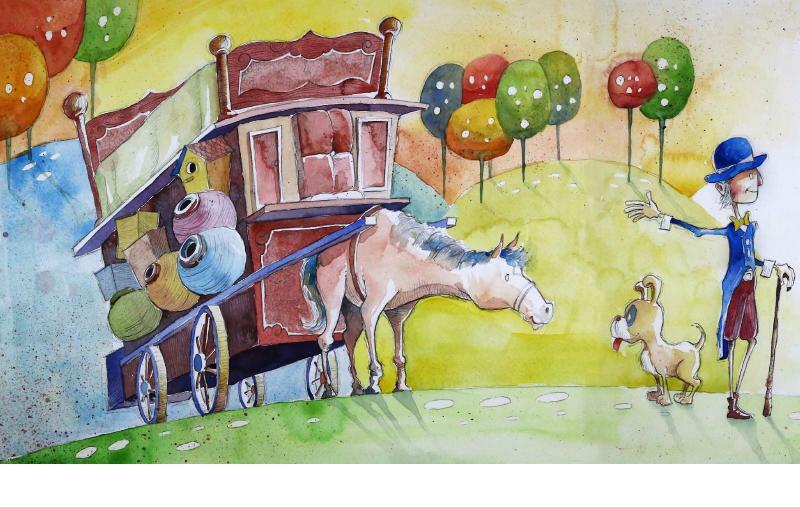 The Peddler’s Bed is about a hard working old man who is greeted by a traveling peddler. Upon his cart is a fine bed, “crafted … from the hardy oak trees that grow on the other side of the hills …” Tending his garden, the little man looks up and then, showing common courtesy, gives the salesman his undivided attention. When the peddler promises then demonstrates how this wondrous bed doesn’t squeak, my guard went up, convinced the peddler was laying on a hard sell with the end goal of taking advantage of the polite, maybe naive little man. I just had to read on to find out what Fortino was planning. Clearly impressing the old man, the traveling salesman offers the bed “at a very fair price,” only the little man hasn’t a penny to spare. When the peddler proposes to give the man the bed provided he “can think of a way to make my oak bed squeak by sunset,” he’s assured the comfy bed will be his, and cannot refuse the challenge. Hopeful of the prospect of winning such a fine bed, the little man shares the shade of his porch then prepares dinner for the salesman as the two enjoy each other’s company. Fortino’s peppered the story with lots of teasing, red-herring squeaks everywhere inside and outside the old man’s tiny house, everywhere except the bed. 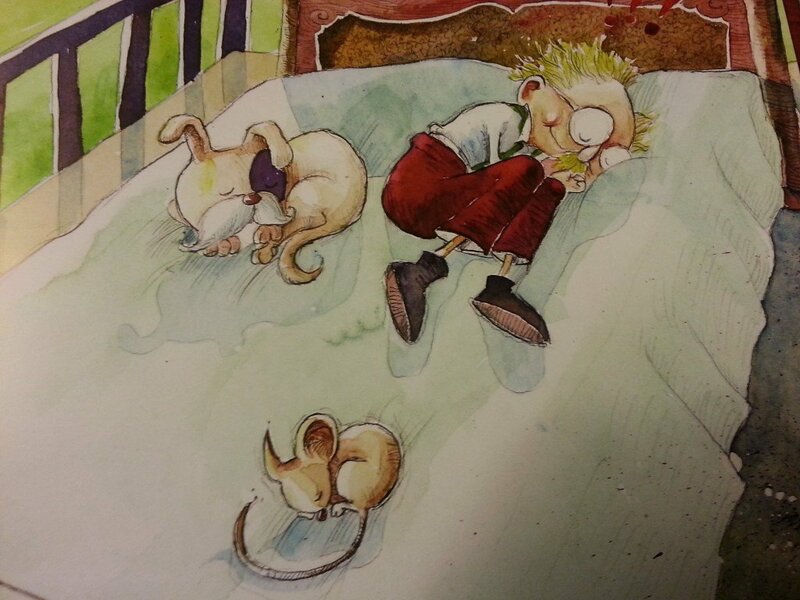 Realizing he’s lost the bet, the man accepts the peddler’s invitation to try out the bed anyway and proceeds to fall into a deep, squeak-filled (snoring) sleep. The final gesture by the departing peddler, one of kindness and generosity after noting the little man’s grace and hospitality despite his hand-to-mouth existence, is one that will reward readers in the best possible way. The Peddler’s Bed is a charming story of humanity and brings a renewed faith in the random kindness of strangers found in the most unexpected places in the most delightful ways. You are so welcome, Lauri. I’m looking forward to reading whatever you write next. Such a wonderfully, sweet story! A bedtime favorite in my house. I agree, Robin. I smile just thinking about the peddler’s kindness.